Afraid of biometrics because you think they are unsanitary and germs are being spread? Purdue University’s Biometric Standards, Performance and Assurance Laboratory has conducted a study to determine how much bacteria live on biometric devices after use. The researchers found that while the glass surfaces of fingerprint or hand geometry scanners may contain prints or other dirt, they only harbor the same amount of bacteria as typical doorknobs. During the study, three types of biometric devices (fingerprint, hand geometry and vein recognition) were coated with staph and E. coli bacteria. 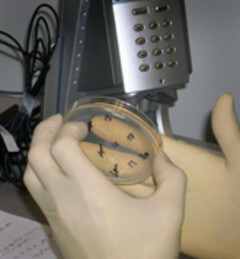 Subjects, wearing sterile gloves, touched the devices and the transfer of bacteria was measured. An identical test on a metal doorknob found that the bacteria transferred to subjects’ hands were nearly identical to that of the biometric devices. WEST LAFAYETTE, Ind. — While biometric equipment is gaining popularity in a variety of applications, such as ensuring secure access to buildings, industries are finding that many users believe the devices are unsanitary and a potential source of germs that could cause illness. But a Purdue University study has found that while the platen glass surfaces of devices that scan fingerprints or hand geometry may look more unsanitary due to visible dirt and prints, they in fact harbor about the same amount of bacteria as a typical doorknob. Christine R. Blomeke, a researcher and doctoral student in Purdue’s Biometric Standards, Performance and Assurance Laboratory, performed the study along with lab director Stephen J. Elliott, an associate professor of industrial technology, and Thomas M. Walter, a continuing lecturer in the Department of Biological Sciences. Blomeke said the study was conducted because of participant comments made during fingerprint and hand-geometry studies at the lab. She said the subjects, who were required to touch their hands or fingers to the sensors, questioned the cleanliness of the surfaces. “When you look at these devices, finger moisture, dirt and oils cause the surface to appear to be dirty,” Blomeke said. “In a study we did on this last year, more than a quarter of the participants indicated that they thought the devices were somewhat unsanitary. The results of the study were presented this week at the Institute of Electrical and Electronics Engineers International Carnahan Conference on Security Technology in Ottawa, Ontario, Canada. For the study, Blomeke’s team examined the bacterial recovery and transfer from three types of biometric sensors: fingerprint, hand-geometry and vein-recognition devices. Each sensor was tested separately with two kinds of bacteria: Staphylococcus aureus, a common cause of blood and skin infections, and Escherichia coli, commonly known as E. coli, which can cause diarrhea, urinary tract infections and meningitis. 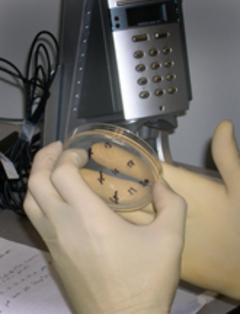 To test how well the bacteria could survive on a biometric device, the surfaces were first sterilized to kill existing bacteria, then coated with a bacteria culture. Testers used sterilized gloves to touch the biometric device surface after five, 20, 40 and 60 minutes to measure how many of the bacteria were still alive and could be transferred. Testers first touched the device surface, then a sterile plate or Petri dish containing growth media to allow any bacteria present to be more easily examined. The solution on the plate was allowed to grow for 24 hours at 37 degrees Celsius (approximately 99 degrees Fahrenheit). The next step was to test for bacterial transfer from the biometric device. To do this, the devices were sterilized, then testers wearing sterilized gloves touched the device surface and a sterile plate to measure how many bacteria were present before it was contaminated. Next, the device surfaces were contaminated with one species of bacteria at a time, and testers wearing sterilized gloves touched the device surface, then touched a sterile plate containing growth media 50 times. Just as in the other test, the solution was allowed to grow overnight to quantify the number of live cells recovered from touching the contaminated device. Researchers found that E. coli survived on the devices slightly longer than staph bacteria, but within 20 minutes, nearly all of the bacteria had died on all three devices. Finally, a metal doorknob was tested with the same methods. Researchers found that the transfer of bacteria from the doorknob to another surface was nearly identical to that of the biometric devices. Blomeke said that on the doorknob, as well as on the three biometric devices, the majority of bacteria was transferred within the first 10 touches. Blomeke said that since naturally occurring organisms live on our skin at all times, as well as on frequently touched common surfaces, the fact that some bacteria live on biometric devices shouldn’t deter people from using them. Blomeke said hygienic concerns – whether on high-tech or low-tech surfaces or devices – can easily be alleviated. “It’s always a good idea to get in the practice of washing your hands with soap and water or keeping antibacterial solution handy,” she said. The Biometric Standards, Performance and Assurance Laboratory is housed in the Department of Industrial Technology in Purdue’s College of Technology. In the lab, researchers and students test and evaluate equipment for iris, vein, hand, fingerprint, signature, keystroke and face recognition. In addition, courses in automatic identification, data capture, and biometric technology and applications are taught in the lab.